Cathy Freeman, OAM (born 16 February 1973) is a retired Australian sprinter. She ran mostly in the 400 metres event. She became the Olympic champion for the women's 400 metres at the 2000 Summer Olympics. She lit the Olympic Flame at the beginning of the 2000 games. She has won several medals at the Commonwealth Games, the Olympics, and the IAAF World Championships. She retired from athletics in 2003. Freeman was born in Slade Point, Mackay, Queensland. She is Aboriginal. Her mother was born in the Manbarra community on Palm Island. Freeman was raised as a Bahá'í. In 1998, she was awarded Australian of the Year. In 2001, she was given both the World Sportswoman of the Year and the Medal of the Order of Australia. Cathy Freeman began athletics at the age of two. Her first coach was her stepfather, Bruce Barber. By her early teens she had a collection of regional and national titles, having competed in the 100 m, 200 m, high jump and long jump. In 1987, Freeman moved on to Kooralbyn International School to be coached professionally by Romanian Mike Danila, who became her first coach and later a key influence throughout her career; he provided a strict training regime for the young athlete. In 1988, she was awarded a scholarship to an exclusive girls' school, Fairholme College in Toowoomba. In a competition in 1989, Freeman ran 11.67s in the 100 metres and Danila began to think about entering her in the Commonwealth Games Trials in Sydney. In 1990, Freeman was chosen as a member of Australia's 4 × 100 m relay team for the 1990 Commonwealth Games in Auckland, New Zealand. The team won the gold medal, making Freeman the first-ever Aboriginal Commonwealth Games gold medallist, as well as one of the youngest, at 16 years old. She moved to Melbourne in 1990 after the Auckland Commonwealth Games. Shortly after moving to Melbourne Nic Bideau, her manager, introduced Freeman to athletics coach Peter Fortune, who would become Freeman's coach for the rest of her career. She was then selected to represent Australia at the 1990 World Junior Championships in Athletics in Plovdiv, Bulgaria. There, she reached the semi-finals of the 100 m and placed fifth in the final of the 400 m.
Freeman competed in her second World Junior Championships in Seoul, South Korea. She competed only in the 200 m, winning the silver medal behind China's Hu Ling. Also in 1992 she travelled to her first Olympic Games, reaching the second round of her new specialty event; the 400 metres. At the 1993 World Championships in Athletics Freeman competed in the 200 m, reaching the semi-finals. 1994 was Freeman's breakthrough season, when she entered into the world's elite for the first time. Competing at the 1994 Commonwealth Games in Canada, Freeman won gold in both the 200 m and 400 m. She also competed as a member of Australia's 4 × 100 m squad, winning the silver medal and as a member of the 4 × 400 m team, who finished first but were later disqualified. During the 1994 season, Freeman took 1.3 seconds from her 400 m personal best, achieving 50.04 seconds. She also set all-time personal bests in the 100 m (11.24) and 200 m (22.25). Although a medal favourite at the 1995 World Championships in Athletics in Sweden, Freeman finished fourth. She also reached the semi-finals of the 200 m.
Freeman made more progress during the 1996 season, setting many personal bests and Australian records. By this stage, she was the biggest challenger to France's Marie-José Pérec at the 1996 Olympics. She eventually took the silver medal behind Pérec, in an Australian record of 48.63 seconds. This is still the sixth-fastest time ever and the second-fastest since the world record was set in Canberra, Australia in 1985. Only Sanya Richards-Ross has come within a quarter of a second of Freeman's time since. Pérec's winning time of 48.25 is the Olympic record and the third-fastest ever. In 1997, Freeman won the 400 m at the World Championships in Athens, with a time of 49.77 seconds. Her only loss in the 400 m that season was in Oslo where she injured her foot. Freeman took a break for the 1998 season, due to injury. Upon her return to the track in 1999, Freeman did not lose a single 400 m race, including at the World Championships. Freeman also lit the torch in the 2000 Olympic Games in Sydney. 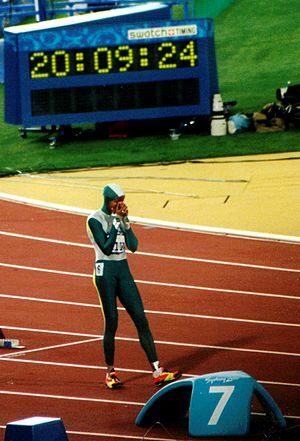 Freeman preparing to race in the Olympic 400 m final, Sydney 2000. Her winning streak continued into the 2000 season, despite Pérec's return to the track. Freeman was the home favourite for the 400 m title at the 2000 Olympics in Sydney, where she was expected to face-off with rival Pérec. This showdown never happened, as Pérec left the Games after what she describes as harassment from strangers. Freeman won the Olympic title in a time of 49.11 seconds, becoming only the second Australian Aboriginal Olympic champion (the first was Freeman's 4 × 400 teammate Nova Peris-Kneebone who won for field hockey four years earlier in Atlanta). After the race, Freeman took a victory lap, carrying both the Aboriginal and Australian flags. This was despite the fact that unofficial flags are banned at the Olympic Games and the Aboriginal flag, while recognised as official in Australia, is not a national flag, nor recognised by the International Olympic Committee. Freeman also made the final of the 200 m, coming sixth. In honour of her gold medal win in Sydney, she represented Oceania in carrying the Olympic flag at the opening ceremonies of the next Olympics, in Salt Lake City, joining Archbishop Desmond Tutu (Africa), John Glenn (The Americas), Kazuyoshi Funaki (Asia), Lech Wałęsa (Europe), Jean-Michel Cousteau (Environment), Jean-Claude Killy (Sport), and Steven Spielberg (Culture). Throughout her career, Freeman regularly competed in the Victorian Athletic League where she won two 400 m races at the Stawell Gift Carnival. Freeman did not compete during the 2001 season. In 2002, she returned to the track to compete as a member of Australia's victorious 4 × 400 m relay team at the 2002 Commonwealth Games. Freeman announced her retirement in 2003. Since retiring from athletics Freeman has become involved in a range of community and charitable activities. She was an Ambassador of the Australian Indigenous Education Foundation until 2012. Freeman was appointed as an Ambassador for Cottage by the Sea, alongside celebrity chef Curtis Stone and big-wave surfer Jeff Rowley. Freeman retired from her position as Patron after 10 years in 2014. 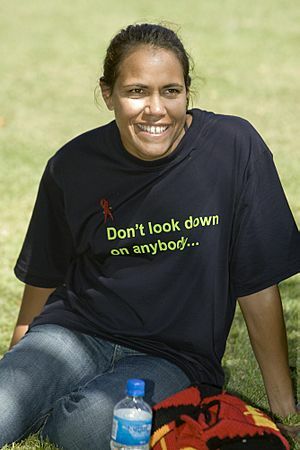 In 2007 Cathy Freeman founded the Cathy Freeman Foundation. The Foundation works with four remote Indigenous communities to close the gap in education between Indigenous and non-Indigenous Australian children, by offering incentives for children to attend school. Cathy Freeman Facts for Kids. Kiddle Encyclopedia.